The worst thing about this same road is the traffic. There is a worrying frequency of signs stating how many people died at that specific spot. I usually try to find alternative routes in such cases, but here there were none, at least according to my map. This is proving to be one of the worst country maps I’ve ever used. Whoever was responsible for producing the International Travel Map for Ghana needs to improve their cartography skills. Not only does their map not include simple road distances between places, but they have drawn roads which don’t exist and have depicted what are in fact large sprawling towns to be villages. Ghanians would agree with me if they could read maps. 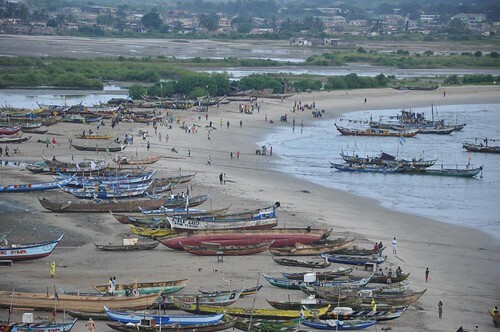 I broke the two day cycle from Cape Coast to Accra by stopping over in the fishing village of Apam. It was a worthwhile detour, mostly because I got to sleep in a 300-year old slave fort. It was originally built by the Dutch, but handed over to British control 100 years later. This was about the only information I could decipher from Grace, the fort’s female caretaker. I highly recommend it for those making the same journey. You sleep with the sound of the waves crashing below you and wake up to a view worth far more than the £2 it costs to stay here. There is no electricity or running water, but anyone overlanding in Africa ought to be familiar with this minor inconvenience. Candle-light is far more appropriate in such places. The ride into Accra was hot; the kind of heat that turns your Tilley hat stiff with salt stains. 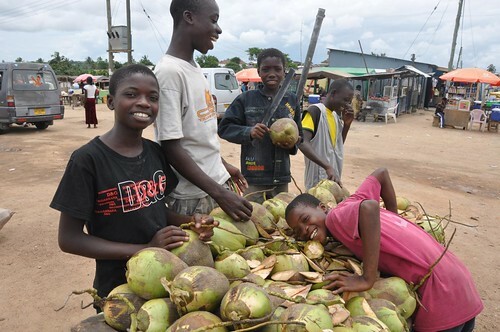 Fortunately filtered water is very cheap in Ghana (like £0.02 for a 500ml sachet) and frequently available, usually sold chilled in blue cool-boxes at the roadside. I never remember water being sold like this when I first went to Africa 10 years ago. I have no idea to what extent this water has been tested or approved by any regulatory body, but my stomach seems to be coping OK. 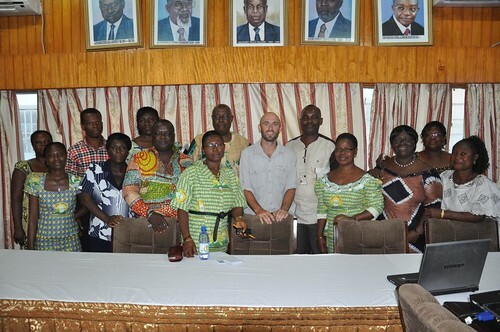 The hospitality I’d received in Takoradi a few weeks previously was extended in Accra. My host here was director of the Accounts department for the country’s National Audit Service. In other words a Ghanian of some rank. Not so long ago he was a night security guard in central London, a job which allowed him to study through his shift. This was the real reason he’d gone to the UK. He told me this after I’d followed his chauffeur-driven SUV way out of Accra to a large hotel by the sea. We’d only just met, I’d pulled him out of his busy job and now he was buying me lunch. The following 5 days in Accra were centered around applying for visas and giving presentations about my journey(s) by bike. Almost half of that time seemed to be spent in traffic, where armies of street hawkers brush past your window selling anything that can feasibly be carried by hand or head. “This is nothing compared to Nigeria”, remarked my host George, who lived some 20km east of the city centre. His daily commute, which we did for the remainder of the week in his newly re-sprayed Mercedes, took between 1-2 hours each way. It would certainly have been faster on a bicycle, which would naturally have been my mode of transport had it not been for the convenience of having a driver assigned to take me to the necessary embassies. Nigeria was up first and I arrived at the new address (20/21 Roman Ridge road, just off Achimota road for those who might need it) lacking the necessary documents to secure a visa. Up until now west African visas have been a doddle to apply for. This one required an invitation from the country, although in reality I just needed a hotel reservation from Nigeria, plus photocopies of my insurance details and vaccination certificates. I went away to find an Internet Cafe and returned an hour later with a printed online booking. It was totally false, and handing it in felt a bit like playing a Nigerian trickster at his own game. Does anyone ever fall for those bogus e-mails saying a relative has recently died and left a huge sum of money that can only be released if you agree to be guarantor? The reservation was merely a formality, along with the other bits to be handed in with the $130 (West African visas don’t come cheaply) before being told to return at 14.30 the following day. I opted to take a tro-tro (Ghana’s version of an overloaded and uncomfortable mini-bus) back into the centre, (even though I probably could have telephoned for a driver) and found the city’s National Museum. This is the first I’ve been to on this trip and a welcome diversion from the city’s shadeless streets. I was the only visitor that afternoon and had to wake the Museum’s shop assistant to buy some postcards. She shuddered when I told her I’d been at the Nigerian embassy to apply for a visa. “Why are you going there? It is full of crooks”. Her reaction and remark is one echoed by many Ghanians, who consider their nearest Anglophone neighbour in west Africa to be something of a big bully. 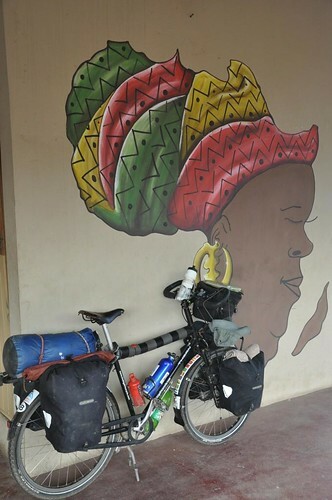 It is a little daunting to think that 1 in every 5 Africans on the continent is a Nigerian, and there have been very few people in recent months who’ve responded with anything positive to say when I’ve told them I’m going to cycle across the country. The embassy of Benin was equally as hard to find the next morning (19 Volta street, 2nd close Airport Residential district), although the visa cost one third the price of the Nigerian and didn’t necessitate the paperwork nor the overnight wait. Rumour is it I could probably get the visa at the border, which is what I’m hoping for with the Togolese visa (I was reluctant to part with 25,000 west African francs at the embassy when I heard it is 10,000 at the border). 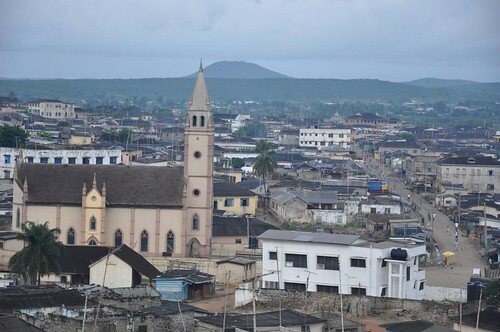 I realise all this information is beyond the interest of most readers, but for the few overlanders google searching ‘Nigeria visa Accra’ or ‘Benin visa cost Accra’, perhaps this blog post will be of help. Mid-way through my stay in Accra George had taken it upon himself to get the media onto my story. Several journalists and a camera crew turned up in his office trying to figure out what the connection was between an English cyclist and the country’s National Audit Service. The interview went ahead, I struggled to keep a straight face and my voice was failing having already given two talks to an American International School in the morning. But George had also arranged for me to speak to the Audit Service team in the boardroom. This was my first all-African audience and typically they wanted to know why I wasn’t afraid of all the wild animals. As a parting gift to George and his wife I decided to print out two of my photos and have them framed . They were delighted and hoped I’d stay for Sunday Service at Church. I had the Lake Volta weekly ferry that departs on Monday as an excuse. Are you able to have people send you packages before you arrive to certain destinations? If so, how do you arrange that? Just to let you know that we loved every minute of our drive through Nigeria earlier this year. We took roughly the same route you will be taking & encountered nothing but open, generous, friendly people. Abuja is probably the most chilled capital city in Africa! 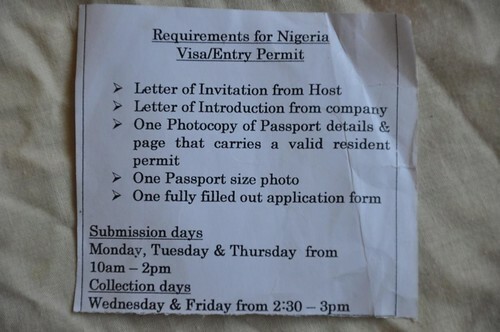 Cameroon Visa – easy to get in Abuja, no letter of introduction required. I’m sure you have heard about free camping for overland travellers at the Sheraton, Abuja. Finally – one contact you may find useful in Cameroon are a couple in Limbe – Dave Robertson & Julia Samuel who run their own charity, Drive Against Malaria (wwww.driveagainstmalaria.org). A great couple who are doing wonderful work out there. @Taniya Morris, Yes, I had heard rumour of free camping for overlanders at the Sheraton in Abuja. Was wondering what the catch was? I wonder if there are squash courts attached – wouldn’t mind getting on court again. Will check out that Cameroon contact so thanks for sending this. @Peter, I have e-mailed you the details of a useful contact in Abuja. Let me know if you get it. I might be able to put you in touch with some folks in Jos or Mubi if you’re heading through either of these towns. My husband and I are American expats living in Lagos. We’ve driven that road in Ghana from Cape Coast to Accra and love the wonderful road conditions and light traffic compared to what we deal with in Lagos. I don’t know if you’re going to try to bike through Lagos, but I hope if you do you’re very careful! We had a young Nigerian friend who bikes to work recently get very seriously injured after being hit by a car. The drivers are very reckless here and traffic is very busy and road conditions are horrible. But though we don’t have opportunity to travel much, when we are able to get into the countryside I’ve found people very friendly and helpful and welcoming. I think you’ll be surprised at their friendliness — at least I hope that will be your experience. I love Nigerians, though they are quite passionate, so be careful if there is a wahala on the road, it can get explosive very quickly. If you are coming through Lagos and would like local contacts or a place to stay, please get in touch with me. Hi Carole. I am planning to avoid Lagos and will cross the border from Benin further north. There is no need for me to visit Africa’s busiest city? as I will be heading to Abuja for visas. Despite a lot of bad press and negative comments about Nigeria (often from people who haven’t been, else only in Lagos) I am looking forward to exploring the country. I have a 60 day visa. I have tried to make contact with some international schools in Abuja, who might be interested in hearing me speak and possibly host me, but so far no replies from my e-mails. If you have any contacts there it would be most welcome to be put in contact with them. enjoying the reading a lot! keep up the good work! Wow — This had me laughing out loud. Brings it all back for me! Did you get a Cameroonian visa? Equally as expensive and you have to have an invite for there, too. What’s on your itinerary for Cameroon? Still happy to put you in touch with some locals there if you want. Be sure to hit Limbe. Sweet — When you know your plans, let me know if you’ll hit the western side of the country. Happy to introduce you to friends in Dschang (French-speaking but also decent English), but I don’t want to send them an e-mail unless you know you’re going through — Would get their hopes up! I will look Dschang up on my map. Don’t have a planned route yet for Cameroon. Thanks for this.